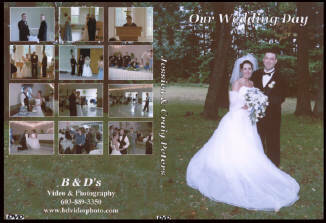 All my Wedding DVDs are custom made to reflect the wedding day's activities.I use only the best quality video encoder, AC3 encoder, authoring and burning software in the market. I also use the best quality printable DVD disks. All my authored DVDs have a very high compatibility ratio. encoder used can make a video look great or very bad. Cheap encoders will not do a very good job. Authoring is the process of collecting audio, video, menus, subtitles, etc into an interactive branching structure that will eventually become a playable DVD. 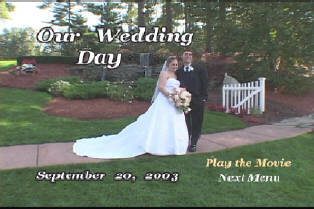 You need DVD authoring software to make a playable DVD. All in one Encoding/Authoring programs are easier to use and cheaper to buy, but has a bad compatibility ratio and the disks may not work on many DVD players. Some of the new cheap DVD disks have a problem with DVD Rot. These disk can deteriorate and become no good in two to five years. This problem with cheap disks has already started to show up in some CD and DVD disks. These units work like your VCRs, but use DVD disks instead of tape. These units have many restrictions to the length of the video and the quality. Movies longer than one hour will have reduced quality. Set-top burners also do not offer custom menus and usually have a very bad compatibility ratio and may not work on many DVD players.